A Certified Tree Expert (CTE) is a person who has been examined and proven to be competent in the science and art of diagnosing, treating and preventing tree injuries. These professionals demonstrate high ethical and moral standards in the practice of tree care and are certified by the Board of Tree Experts. CTEs produce correct, long-term management techniques required in the science of tree care. C.C. Tree Service has been awarded the prestigious Angie’s List Super Service Award every year since the program's inception. This honor is bestowed annually on approximately 5 percent of all the businesses rated on the nation’s leading provider of consumer reviews on local service and health providers. 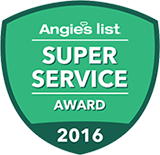 Angie’s List Super Service Award winners have met strict eligibility requirements including earning a minimum number of reports, an exemplary rating from their clients and abiding by Angie’s List operational guidelines.